Houdini’s interface is divided into rectanglar panes, with each pane containing at least one editor or view tab. You can add more tabs, just like browser tabs, where each tab contains a different pane type, or similar pane types viewing different data. You can add, remove, resize, and reconfigure the panes. You can switch to alternative layouts, and create and save your own custom layouts. Panes can exist in floating windows on top of the main window. Houdini ships with different desktops suited to different tasks. A desktop is a preset pane layout, set of shelf tabs, and default radial menu designed for specific tasks, such as modeling or shader building. Houdini ships with several pre-made desktops, and you can also save and use your own custom desktops. You can work with desktops using the desktops list pop-up menu at the top of the main window. On Mac, Houdini has a Desktops menu in the main menus instead of a pop-up in the main window. Open the Desktop list menu and choose the desktop to switch to. Open the Desktop list menu and choose Save current desktop as. Open the Desktop list menu and choose Save current desktop. Open the Desktop list menu and choose Reload current desktop. Open the Desktop list menu and choose Desktop manager to open the desktop manager window. Open the Desktop list menu and choose New desktop. The new desktop starts with a single viewer pane and blank shelf. You will have to re-add the shelf tabs you want to be available in the new desktop. See how to use the shelf. Drag the divider between the panes. Click one of the arrows near the center of the divider. You can click the arrow again to expand the panes again. Click the maximize button in the pane’s tab bar. Click the new tab icon in a pane’s tab bar and choose the pane type for the new tab. These are some useful controls for large-scale editing of the pane layout. If you mess up the pane layout, you can reset to the last saved version of the layout by opening the Desktop list pop-up and choosing Reload current desktop. Click the pane’s menu and choose Split left/right or Split top/bottom. Click the pane’s menu and choose Close pane (all tabs). Click the center of the divider. Alt-click the center of the divider. You can open a new window that floats above the main window that can hold its own set of panes and tabs. This is especially useful when you have multiple monitors. You can keep a second window full of useful panes on a separate monitor from the main window. You can drag and drop pane tabs between panels and between a panel and the main Houdini window. Choose Window ▸ New floating panel. Open the pane menu and choose Floating panel ▸ Attach this panel to desktop. Any floating panels that are open when you save the desktop are "attached" to the desktop, so they are only visible when that desktop is active. When you choose a Move X to this panel item (for example, Move main menu to this panel), the item changes to Reset X to desktop (e.g. Reset menu menu to desktop). Choosing the item again resets the user interface element back to its default place in the main Houdini window. When this option is on, the panel only appears when the current desktop (pane configuration) is open. See how to use desktops above. When this option is on, the panel fills the screen without any window border. This is useful for a floating panel on a secondary monitor in a multi-monitor setup. Moves the main menu from the main Houdini window to the top of this panel. This item is only available on Windows and Linux. See also > Pane interface ▸ Move main menu here, which puts the main menu at the top of an individual pane rather than across the top of all panes in a panel. Moves the shelf from the main Houdini window to the top of this panel. After you use this command to move the shelf, it changes to Reset shelf to desktop. Choose this item to return the main menu to its default position in the main Houdini window. Moves the playbar to the bottom of this panel instead of along the bottom of the entire main window. Moves the status bar to the bottom of this panel instead of along the bottom of the entire main window. Only available on Windows and Linux. Viewer and editor panes show the path of the at the top of the pane. Click any of the components of the path to jump to that network level. Right click the path for a menu of options. Click the menu button at the right end, or click the arrows at the left end to navigate through the history of locations. Press ⌃ Ctrl + L to hand-edit the location if you know the exact path you want to go to. When you dive into a Geometry container in the network editor, the 3D view also switches to the show the geometry network inside. When you select a node in the network editor, the parameter editor switches to show the parameters for the selected node. 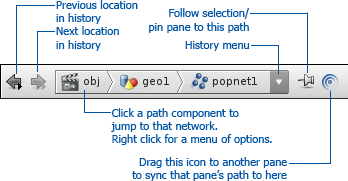 Click the Pin button at the top of a pane tab to pin the tab to its current network/node. When the button is pushed in, the tab will not follow the selection. When you create new tabs of certain types, such as new network editor tabs, Houdini automatically creates them pinned, since it assumes you only need one pane automatically following the selection. Tab linking can be complicated and unintuitive. Longtime Houdini users may have workflows that rely on linking, but new users can probably ignore it and just use pinning and unpinning. The default unpinned tabs follow each others' selection because they are linked. Linking is kind of like watching a channel: all the default tabs are watching the channel called Last Selected Node, so when the selected node changes, the linked tabs switch to that network. You can choose to tune some tabs into a different channel (for example, channel 1 or channel 2), so that those tabs will change networks together, and ignore changes to the locations of tabs that are watching other channels. To set a tab’s channel, right click the Pin button at the top of the tab, then choose a channel for the tab to follow. "No link" means the tab is pinned, so it won’t change in response to what happens in other tabs. The pin icon changes to the pinned icon. "Last Selected Node" means the tab is unpinned, so it will follow the selected node. The pin icon changes to the unpinned icon. Choosing a channel number means all tabs on that channel will change networks together. The pin icon changes to show the channel number instead of an icon. You can have Houdini color code panes by the type of network they're viewing. This might be useful to help keep track of when you're viewing an object, geometry, or dynamics network. Choose Edit ▸ Preferences ▸ General User Interface and turn on Color pane headers with network contexts. Right click an existing tab to change its pane type. Drag the sync icon from one pane onto another to switch that pane to the first pane’s location. Click the pane menu icon in the top right corner of a pane to open a menu of pane management items. This submenu lists each pane type. Choosing an item switches the contents of the current tab to that type. This menu also includes any python panels you have set up to appear in the pane type list. Switch the current pane tab to a scene viewer. Switch the current pane tab to a network editor. Switch the current pane tab to a parameter editor. Switch the current pane tab to a tree View of the networks in the scene. Switch the current pane tab to a take list. Switch the current pane tab to textport. Switch the current pane tab to python shell. Switch the current pane tab to an animation Editor. Switch the current pane tab to a channel List. Switch the current pane tab to a Motion FX (CHOP) viewer. Switch the current pane tab to a Render Scheduler. Switch the current pane tab to a compositing (COP) viewer. Switch the current pane tab to a Material Palette. Switch the current pane tab to a render (IPR) view. Switch the current pane tab to a light linker. Switch the current pane tab to a bundle list. Switch the current pane tab to a geometry spreadsheet. Switch the current pane tab to handle list. Switch the current pane tab to a parameter spreadsheet. Switch the current pane tab to a data tree, a scriptable tree/spreadsheet view. Switch the current pane tab to a vontext viewer that automatically changes type based on the currently selected node. Switch the current pane tab to a performance monitor. Switch the current pane tab to an embedded help browser. Switch the current pane tab to an Orbolt asset browser. Switch the current pane tab to a Python Panel, a scriptable custom pane UI. Switches to the previous tab in the pane. If the first tab is active, this wraps around and switches to the last tab. Switches to the next tab in the pane. If the last tab is active, this wraps around and switches to the first tab. Removes the current tab from the pane and puts it in a floating window. Copies the current tab into a floating window. Removes the current tab from the pane. Restores the last pane tab closed in the current pane. Toggle the current pane between filling the entire layout and its normal size/position. This is the same as clicking the maximize icon. Toggle the current pane between filling the entire row/column and its normal size/position. Remove the current pane from the layout, along with any tabs in the pane. Split the current pane into two new panes on the left and right. Split the current pane into two new panes on the top and bottom. This submenu contains UI settings for the pane. If you choose Move shelf here or Move playbar here, the item will change to reset the shelf/playbar to their default positions. Move the shelf from the top of the main window into this pane. To return the shelf to its default position, choose Desktop ▸ Reset shelf to top. Move the playbar from the bottom of the main window into this pane. To return the playbar to its default position, choose Desktop ▸ Reset playbar to bottom. Move the status bar from the bottom of the main window into the current pane. Move the main menus from the top of the main window into the current pane. This has no effect on Mac OS. Move the playbar from the main window to the current window. Move the shelf from the main window to the current window. Move the status line from the main window to the current window. Move the main menus from the main window to the current window. Attach this panel to the current desktop. ??? Toggle the current window between fullscreen mode and regular window. Hide or show the current pane. Hide or show the tab interface across the top of the current pane. Hide or show the path/user interface at the top of the current pane. Open an bookmark editor (for path-based pane tabs). Add the current pane’s path as a new bookmark (for path-based pane tabs). Add 1 to the current pane’s link number (for path-based pane tabs). Subtract 1 from the current pane’s link number (for path-based pane tabs). Toggle link as parent state. Pin/unpin the current pane tab (for path-based pane tabs). This is the same as clicking the pin icon in the tab. Go to the previous location in the the current pane tabs’s path history (for path-based pane tabs). Go to the next location in the the current pane tabs’s path history (for path-based pane tabs). Make the current pane tab’s path editable in a text box (for path-based pane tabs).